Viewing 24 of 108 items. Set of 25 foldover white note cards with border as shown. Your name is flat printed in ink color as shown with your choice of typestyle. Blank white envelopes included. Card size 4.25" x.. Featuring your imprint under a row of Elephants design, this set of classic European stationery is produced in Prague, CZ by skilled craftsmen. 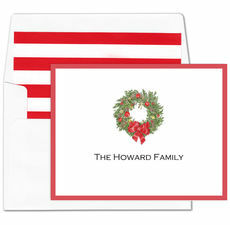 Printed on high-quality natural white paper paper made..
Fabulous foldover note cards featuring your personalization. Flat printed in typestyle and ink color only as shown. Size 5.5" x 4.25". Blank white envelopes included. Printed return address in flat..
From a pristine writing desk comes correspondence most eloquent. Without even reading its words, this ecruwhite Kid Finish folded note, elegantly presented with an engraved gold monogram in flourished..
A Stationery Studio exclusive! Set of foldover note cards with matching blank envelopes included. Card size is 5.5" x 4.25". Imprint is flat printed in ink color as shown. Your choice of..
With the look of a hand-painted design, these vividly colored fill-in flat note cards are sure to please. Size 5.5" x 4.25". Set of notes includes blank white envelopes. Address label.. 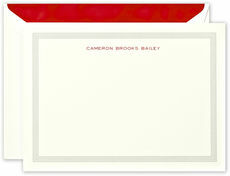 These elegant yet modern foldover note cards are flat printed in typestyle and ink color only as shown. Size 5.5" x 4.25". Blank white envelopes included. Printed return address in flat..
A Stationery Studio exclusive! Set of foldover note cards with matching blank envelopes included. Card size is 5.5" x 4.25". Imprint is flat printed in ink colors as shown. 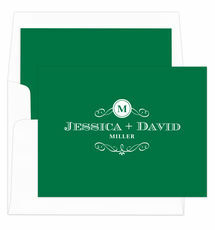 Your choice of..
Set of 25 foldover white note cards with border color as shown. Your name is flat printed in ink color as shown with your choice of typestyle. Blank white envelopes included. Card size 4.25" x..
Personalized Modern Glam Stationery features this season’s must-have accent, luxe gold foil. 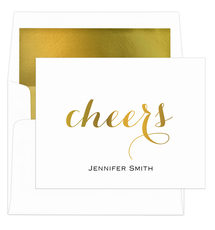 Features the Cheers design as shown elegantly stamped in gold foil. 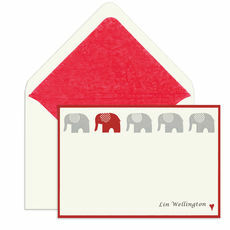 · Foldover notecards ..
A Stationery Studio exclusive! 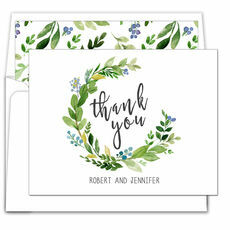 Set of foldover thank you note cards with matching blank envelopes included. Card size is 5.5" x 4.25". Imprint is flat printed in ink color as shown. Your choice of..
Personalized Modern Glam Stationery features this season’s must-have accent, luxe gold foil. 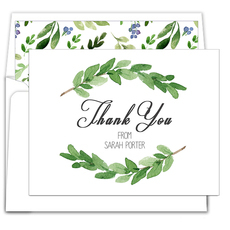 Features the Thank You design as shown elegantly stamped in gold foil. · Foldover.. Featuring your imprint under a hand engraved Christmas rocking horse design, this set of classic European stationery is produced in Prague, CZ by skilled craftsmen. Printed on high-quality natural.. Featuring your imprint under a hand engraved Christmas sled design, this set of classic European stationery is produced in Prague, CZ by skilled craftsmen. Printed on high-quality natural white paper..
A Stationery Studio exclusive! Set of foldover note cards with matching blank white envelopes included. Card size is 5.5" x 4.25". Imprint is flat printed in ink color as shown. Your choice of..
A Stationery Studio exclusive! 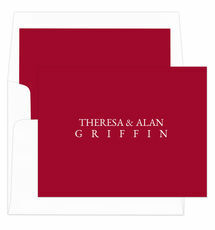 Set of vertical foldover note cards with matching blank horizontal flap white envelopes included. Card size is 4.25" x 5.5". Imprint is flat printed in ink color as..
Personalized Modern Glam Stationery features this season’s must-have accent, luxe gold foil. 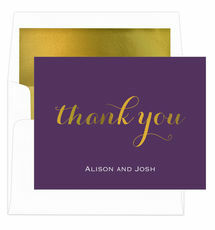 Features the Thank You design as shown elegantly stamped in gold foil. 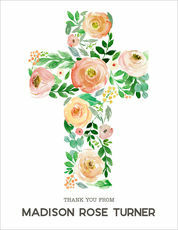 · Foldover notecards · Stamped.. 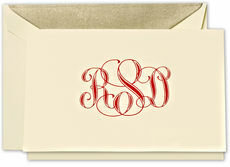 These elegant yet modern foldover note cards are flat printed in typestyle and ink color only as shown. Size 5.5" x 4.25". Blank white envelopes included. Printed return address in flat red ink.. 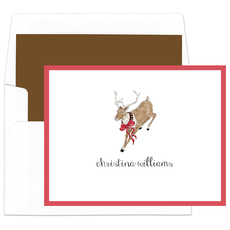 When you need to thank the loved ones, friends and co-workers who sent you or your children a holiday gift, our elegantly designed Christmas thank-you cards help you send a personal message. Our cards include coordinating envelopes and come in sets so that you can coordinate the cards with your customized stationery. Another elegant Christmas thank-you card option is one of our monogrammed note cards. Whether the design is done with raised ink thermography or one of our great embossed designs which makes your initials stand out, the cards will be the perfect touch for your thank you cards. 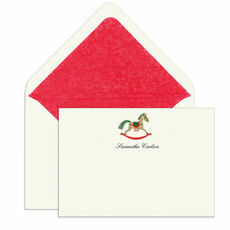 These cards come with envelopeswhich can also be imprinted with a name and a return address for convenient use. For something elegant and unique, try our European-styled Bohemia stationery which is a popular choice for sending correspondence during the holiday season. These note cards feature designs such as a classically designed nutcracker. You can customize these thank-you notes with your name and up to three lines for your address. These note cards use flat black ink, and you can have your return address printed on the envelopes in the same type setting. 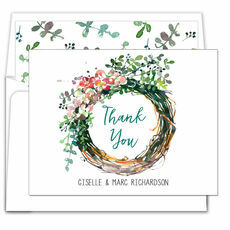 We offer many festive designs for your thank-you notes. You can choose from holiday prints such as a wooden winter sled or a wreath with holly berries. 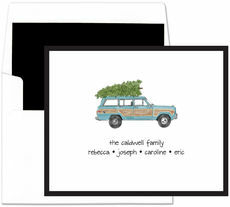 Personalize your cards for yourself or as a very thoughtful and useful gift for the holidays. 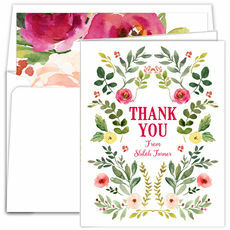 From Crane & Co. designs to many great basic designs, you will find just the perfect item for your thank you cards and for all year when writing notes and general correspondence.